Meeting was called to order at 19:30 with 35 present. We have a quorum. Before the meeting started Ray showed us lightning maps of present time lightning strikes. It was fascinating! The minutes were posted on the website. A motion to accept the minutes as posted was made by Miguel, seconded by Brendan. Corresponding Secretary: Lloyd is at work and not here tonight. Julio stated that there was nothing in the mailbox. Treasurer – Brianna is collecting dues for 2015 and is selling raffle tickets. Julio advised that the Website is currently up and running. Ryan is in the other room with testing. Club Elmer/PIO – Miguel as Club Elmer if you need any help, see him and if he can’t help you he will find some one that can. Otherwise, nothing new. PIO – everything is ok.
Merritt spoke about the Hambulance and the progress that has been made and what still needs to be done. It is in the parking lot. For Field Day – bring your radios. The back door does not lock. We need a chain. It will be parked at the EOC for the next couple of months. It needs to be started at least every 2 weeks. Statewide SET – Miguel reported that it went very well. We had over 50 check-ins. Made good contacts and we found out what deficiencies we have. Hamboree – Miguel reported that nothing is new right now. We are still looking for a location site. I will take place Feb 6 and 7, 2016. If you know of any place, please let him know. Homestead AFB, Tamiami Airport, Opa Locka Airport; and Mall of the Americas were sites that were suggested. The National Hurricane Center has its test about 2 weeks ago. We watched a short segment that was on Channel 4 news. Miguel discussed Field Day. It will take place on the weekend of June 27 and 28. We cannot set up on Friday night because another event is taking place. We can set up Saturday morning before 2 PM. It will take place at the South Dade Agricultural Center, 18710 SW 288 Street, Miami, FL 33030. Exit 5 on the turnpike. DRC is donating food. We will be holding Field Day with Everglades Club and Coral Gables may come. W4SVI will be our call sign. We will get extra points for Joanne since she is an elected official. Any questions, call Steve or Miguel. Miguel announced that a few months back George Phillips KM4EUT donated radios and equipment to the club. To honor him for his contribution to the club, Miguel presented him with a Certificate of Appreciation and he will be an honorary member for 1 year. Congratulations George!!! The 147.000 – Jason advised that it is still on the bench. Miguel suggested that we contact someone at American Tower for help with the tower. He is going to contact John. We need to get the equipment down. The 147.760 – Ray advised it was working. Miguel said that he is experiencing low audio. 220 – Julio stated that he may have a new site for it at Children’s House across from the Miami Police Department. The 444.200 – Carl is not present tonight. Miguel advised its working. It had some interference last week, but is ok now. Digipeater 144.390 – Julio announced it’s the same place as the 200. 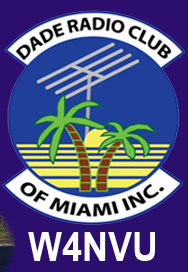 D-Star – Miguel put in the application today. We have officially applied. Ray announced that the 76 coordination has been renewed. All other repeaters are coordinated. Emergency Committee – Miguel advised that he has received a few applications and has passed them on to the county for approval. He is working on a “to go” box and will show and tell soon. Net Manager – Miguel announced that Brandon is doing a great job. We need some other members to run the net on Wednesday nights. It only takes about 30 minutes. New net on Tuesday nights is the American Red Cross 442.625; 110.9 is the PL tone. Brandon advised that we need more net controls. Miguel suggested that we send out an email to see who can participate and sign up for what time and on what frequency. Nets test our equipment weekly on the different frequencies. Find out now before a disaster strikes if your equipment works. Miguel announced the different nets and their frequencies and if they have a PL tone or not. Newsletter – Julio announced that he lost the UBS where he had the newsletter materials and has to re-create it. Julio announced that he will post a link on the website to take a survey on what you want to hear at our meetings for presentations and guest speakers. Ray said if you give a presentation, it’s a great way to practice public speaking. Virgil spoke about a faraday cage and how to make one in case we get hit with an EMP. It will save your equipment. You can use a j-pole as an antenna. Anything electronic will be affected. This is a way that you can protect some of your equipment so that you can communicate. Trailer Project – Miguel stated that we have a trailer for the hambulance. It has a generator. Work will be done on it sometime in the future. If anyone has a date in mind to work on the trailer, let Miguel know. We need a work day to clean it up. Ray announced that there is a hurricane checklist on the website that he has posted. Go to hurricanechecklist.com and check it out. Julio went to check on the testing and came back and announced that we have 3 new techs and 2 new extras. Congratulations!!!! We held a raffle for a duel band antenna and it was won by Dave KM4AW. Congratulations Dave!!! Brandon made a motion to adjourn, seconded by Miguel. The DRC meeting was adjourned at 20:24.